The Age reports on the poster-boy for China’s resurgent New Left, Bo Xilai, one of China’s emerging fifth generation leaders. Famous for attempting to re-invigorate China’s red movement – Red songs ring out in Chinese city’s new cultural revolution (Guardian, April 22, 2011), here’s a background brief on the Bo Xilai 薄熙来’s Chongqing Model from the East Asia Institute, Singapore. Download it here. WANG Li started feeling edgy when her mother was not home by tea time. She called her mobile phone, the voice on the other end sounded calm and reassuring, but even so, she jumped in her car and sped through the winding Chongqing streets to find her. Ms Wang’s mother, Chen Meirong had swapped her bus conductor’s job for a taxi, then a clothes shop and a restaurant. Now she had taken the leap into real estate. Ms Wang parked at the Daisi Hotel and strode through the revolving doors, where she found her mother surrounded by 30 muscular men dressed in black. They sported shaven heads or crew cuts, and addressed each other as Big Brother. On the table was a contract to transfer Ms Chen’s 220 million yuan ($A32 million) tract of land to the government-owned Chongqing International Trust Company, which Ms Chen had spent 10 hours refusing to sign. Ms Chen turned to her daughter, with what she thought was perfect composure, and told her to go home because their business remained unfinished. But Ms Wang grabbed her mother’s wrist, sent a table of teacups flying, and yelled as hard as she could: ”If there is a dispute we can solve it later because YOU HAVE TO LET HER EAT!” And Ms Wang marched her mother back out the revolving doors to safety. Welcome to Chongqing, February 2008, the booming Yangtze River metropolis where government-mafia collusion opened the door for China’s maverick-princeling politician, Bo Xilai, to make his stand. Mr Bo did not stop Ms Chen’s business from being stolen from her, but he did arrest several of the men who bailed her up in the hotel lobby. With equal audacity, Mr Bo revived the revolutionary iconography and techniques of mass mobilisation that had lain dormant since the death of Chairman Mao Zedong in 1976. Mr Bo’s amorphous Chongqing Model as it is now known, is both popular and polarising. He is now the poster-boy for China’s resurgent New Left, while his strongman methods are a source of despair among many on the liberal right. In short, Mr Bo lit a virtual bomb beneath a colourless, consensus-driven Communist Party that faces growing social tensions and is struggling to articulate a rationale for its continued dictatorship. Wang Kang, a Chongqing intellectual who is steeped in party history as well as China’s ancient classics, believes even the actors are not fully aware of the ancient dynastic forces that are at play on Bo Xilai’s political stage. Mr Wang says President Hu Jintao will soon disappear from history, and China’s princelings, the children of the communist revolution, are moving now to fill that void. The Bo Xilai performance, whether nation-changing or colourful sideshow, reached a new crescendo when Mr Bo’s ”sing red” campaign was taken up across the country for the party’s recent 90th birthday celebrations. 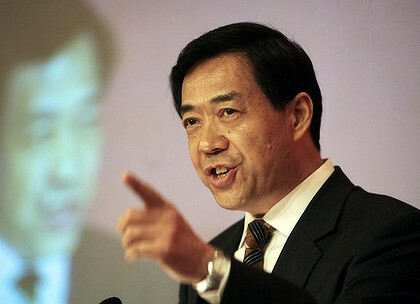 But there are also signs that the Bo Xilai phenomenon is struggling to maintain momentum. Mr Bo’s Red Channel, which started with such fanfare, now suffers random program interruptions and has tumbled down the TV ratings charts, after being deprived of advertising revenue. Even Yang Fan, co-author of The Chongqing Model, which is prominently displayed in the city’s bookstores, is having second thoughts. His U-turn from booster to critic is significant. He was a student at Beijing’s elite No. 4 Middle School, where he watched several ”princeling” classmates hounded out of school as their parents were purged, humiliated and even destroyed during Chairman Mao’s rolling campaigns. One of his close classmates was the younger brother of Bo Xilai. And now Mr Bo’s most popular campaign, against the local mafia, may have be reaching its natural limits before any real resolution. The headquarters of Chongqing International Trust, known locally as Guotou, is a faux colonial-era building in the city’s busiest intersection. The company is ostensibly owned and controlled by the Chongqing city government, although customers and anonymous internet reports claim a majority of shares are in the hands of the chief executive, Weng Zhenjie. A retired Guotou official, who has combed through the company’s reports, told The Sunday Age that he reported Mr Weng’s dealings to the national securities regulator, including a claim that most of the company’s income was illegal. One victim of mafia-backed financial thuggery, a property developer called Zhang Mingyu, has filed repeated complaints about Mr Weng in Beijing and Chongqing. Mr Zhang has hired a prominent lawyer, Pu Zhiqiang, as back-up in case he gets arrested. Mr Pu says it’s not yet time to act but it may be soon, when Chongqing politics begin to shift and other victims come out of the woodwork. When Chen Meirong was rescued by her daughter from the Daisi Hotel lobby she went straight home and wrote her will. Her daughter, Wang Li, is a single mother, like her mother and her grandmother. Ms Wang had kept house for the family and cared for her six younger siblings since she was old enough to cook. She did the shopping while Ms Chen worked all day and most of the night building their modest business empire. Guotou went on to steal her property development, now worth perhaps 500 million yuan, and left her with only debts to her workers and suppliers. Ms Chen had a breakdown, spending eight months in and out of hospital, so her poised and headstrong daughter took control. ”I had thought my mother was strong, so strong that she could solve any problem, but I felt this time she had lost her way,” says Ms Wang. Ms Wang repeatedly tried to contact management at Guotou, even if only to confirm that the company had swindled them, to no avail. One day she picked up a container of petrol and drove to People Power Road. Her mother called, Ms Wang’s voice was calm, and she told her mother she wasn’t doing anything, but Ms Chen left her hospital bed and drove down the road, running every red light. Ms Wang’s car pulled up outside the great double doors of Guotou headquarters. She strode through the marble atrium, and past the screens where a lift would be waiting to take her to Weng Zhenjie’s office on the 10 floor. As security guards fanned out in front of her she doused herself with petrol and demanded they let her though. Then police bowled through the door, at the same time as her mother. They snatched the lighter from her hand.